When he arrived on the Syracuse University campus in 1988, he was chair of the Department of Languages, Literatures and Linguistics (LLL). Today, Harold G. Jones is an emeritus professor of Spanish, a philanthropist and, most recently, the man responsible for establishing an endowment to support Symposium: A Quarterly Journal in Modern Literatures. 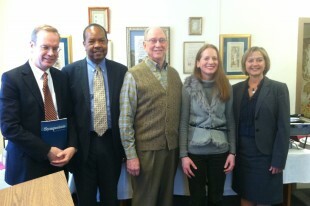 Emeritus Professor Harold G. Jones, center, donated $160,000 to the journal Symposium. 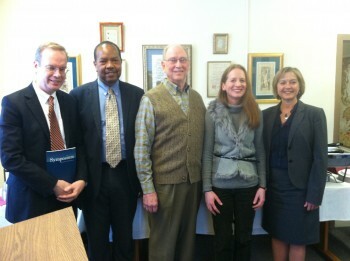 Left to right at the celebration for the donation are Chancellor Kent Syverud, Dean George M. Langford, Jones, Amy Wyngaard and Gail Bulman. The long-time faculty member, who taught in The College of Arts and Sciences for 23 years, has donated $160,000 to create an endowed fund to support activities that promote the scholarly reputation of the journal and broaden the sphere of its outreach. Founded in 1946 at SU, Symposium is a quarterly publication edited by members of LLL in collaboration with 29 associate editors from premier institutions in the United States and abroad. The department’s leadership has positioned the journal as one of the world’s leading periodicals on modern literatures. Contributions, often comparative in scope, examine literary texts written in languages other than English. Amy Wyngaard, the journal’s executive editor since 2007 and professor of French, has ambitious plans for Symposium’s future, many of which Jones’ endowment will support. Published and distributed by Taylor and Francis Group, Symposium is distributed via print and electronic copy to more than 1,900 institutions worldwide.